THIS RESOURCE IS INCLUDED IN A HOLIDAY BUNDLE! 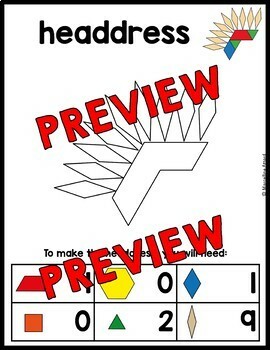 This hands-on fun pack, containing 60 no-prep printable mats , is an ideal resource for Kindergarten and 1st Grade students! Kids have to build each picture with pattern blocks by placing the blocks on the actual mat. Each set is differentiated and contains 10 mats to offer differentiation and challenge for each child. Set 1 includes both color and bw versions. Please note that the pattern block templates are scaled to size. They were designed to be printed on US letter paper (8.5" x 11") in portrait format. No prep: Simply print on cardstock and laminate or place in a page protector. THANKSGIVING MATH GAME: BUILD A TURKEY: NUMBER SENSE GAME! THANKSGIVING MATH GAME: BUILD A PUMPKIN PIE: NUMBER SENSE GAME! THANKSGIVING MATH: BUILD A TURKEY: PLACE VALUE GAME! 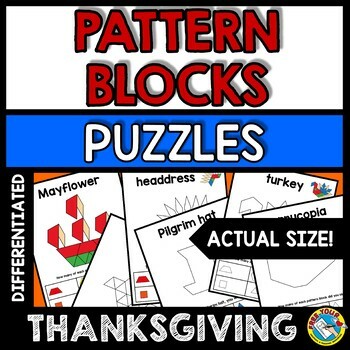 THANKSGIVING MATH GAME: BUILD A TURKEY: 2D SHAPES GAME! THANKSGIVING MATH GAME: BUILD A PIE: FRACTIONS GAME! LITERACY THANKSGIVING ACTIVITIES: BUILD A TURKEY - FINAL/ ENDING SOUND GAME! LITERACY THANKSGIVING ACTIVITIES: BUILD A TURKEY: DIGRAPHS GAME! LITERACY THANKSGIVING ACTIVITIES: BUILD A PIE: WORD FAMILY GAME!